THIS CASE WAS HEARD AT THE COURT OF APPEAL ON 25 MARCH 2014. This case shows the state of the criminal justice system in the UK in all its glory and that it is possible to convict a person of murder purely by rounding up a bunch of crack heads and prostitutes to testify that the defendant stabbed the victim and/or he confessed to the stabbing and/or he had blood on his clothes and/or he carried a knife identical to the murder weapon etc without any forensic link to the crime. In this case Dorset police rounded up around 15 drug addicts and dealers from the crack houses of Bournemouth to testify that Mr Benguit was the murderer, and the 3rd jury believed them. One has to wonder how many times can a person be tried for murder in the UK until a guilty verdict is reached? Omar Benguit was convicted of murdering a Korean student Jong Ok-Shin as she walked home from a night out in Bournemouth and was also alleged to have committed other offences on that same night by the chief prosecution witness, Beverly Brown, an admitted crack/heroin addict and prostitute. During the police investigation she also alleged that witness protection officers had propositioned her for favours, but Dorset police investigated that allegation and found it to be "unreliable". She also started off by naming another person as the murderer. Nevertheless, Dorset police relied upon her to eventually reveal that Mr Benuit was the murderer. The police then rounded up some twenty other drug addicts, prostitutes and dealers over the space of a year from various crack houses in Bournemouth, who were all happy to come to court to testify that Mr Benguit was indeed the murderer of Jong Ok-Shin. All these addicts shared one thing in common apart from drugs: they all had phenomenal memories. Mr Benguit was found not guilty of offences against the chief prosecution witness Beverly Brown and only after being subjected to three trials did a jury find him guilty on a majority verdict of the murder of Jong Ok-Shin, based solely on the testimony of the drug addicts who had been rounded up by the police. One of these crack addicts had such a phenomenal memory spanning more than a year that she was able to provide the police with a statement in the summer of 2003 (taken down by DC Mark Prince) that she remembered seeing Mr Benguit with a "15cm knife with a straight edge and a curved tip" in the summer of 2002. She was called to testify in the 3rd trial. Her description of the knife was identical to the murder weapon and Mr Benguit was finally found guilty. No forensic evidence linked Mr Benguit to the crime, who could not remember where he was on the morning of 12 July 2002. He was given a life sentence of at least 20 years in 2005 and continues to protest his innocence. 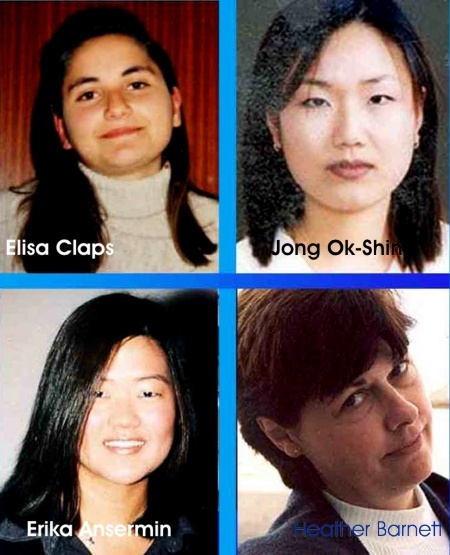 The murder of Korean student Jong Ok-Shin occurred at about 2.50am on 12th July 2002 when she was walking home along Malmesbury Park Road in Bournemouth following a night out with friends. An assailant wearing a "mask" (according to her dying words) stabbed her several times in the back and she died later that morning in hospital. About a month later a woman by the name of Beverly Brown was caught shoplifting and when interviewed for that offence on 22nd August 2002 she was found to have crucial information about the murder. She said that on the night in question she was travelling with three men in her car - Omar Benguit, Nicholas Gbadamosi and Delroy Woolry - and that on entering the road where 'Oki' was walking ('Oki' was Jong Ok-Shin's nickname) the men jumped out and accosted the victim before running back to the car. Ms Brown said Benguit was the murderer by virtue of the fact that when the three men returned to the car, she saw him with blood on his tee-shirt wrapping an object in a towel, which he then put into a shopping bag and stored under a seat, while Gbadamosi (one of the other men) who assisted him in the offence said "what have you done?" or words to that effect - the implication being that Benguit had just stabbed Oki. Ms Brown had even more to say about the three men, which is that immediately after the murder she drove them all to a crack-house in Clements Road, Bournemouth, where they smoked crack cocaine. She then drove them to an unknown cul-de-sac, where other offences involving the use of "red-handled pliers" allegedly took place. Following these offences she then drove the three men to another house in Cunningham Crescent where Benguit had a shower to wash blood from himself. The towel he used together with his blood-stained clothing and knife were wrapped in a plastic bag and thrown by Gbadamosi into a river before Brown was finally allowed to return home to bathe. On another occasion Gbadamosi had committed a serious offence at the Queen's Park Golf Club. Delroy Woolry who was allegedly one of the passengers in Brown's car was interviewed by Dorset police but for some reason he was not charged and allowed to return to Jamaica. He was obviously not one of the "three" men involved. Benguit was charged with the murder of Jong Ok-Shin with Gbadamosi accused of assisting in the offence. They were also jointly charged with other offences. The jury found Gbadamosi not guilty of the other offences but could not reach a verdict on whether he had assisted Benguit in the murder. They were unable to reach any verdicts in respect to Benguit, who had no alibi for the day in question. The prosecution continued to rely on Beverly Brown as a 'witness of truth' and retried Benguit for the murder of Jong-Ok Shin and other offences, while Gbadamosi was again charged with assisting in the murder. Gbadamosi was able to show that a speeding camera had caught him earlier in the evening in another part of town. The jury found him not guilty of assisting in the murder. The jury found Mr Benguit not guilty of the other alleged offences, but could not reach a verdict on the murder charge. It is worth pausing here to note that no DNA from any of the three men or the victim could be found in Brown's car. The CPS then applied for permission from the Director of Public Prosecutions Mr Kenneth Macdonald QC, to launch a 3rd trial, which was granted in January 2005. Lord Macdonald (as he is now known) is described on the internet as a "clever and resourceful man" and it is to be assumed that the investigating police officers and the CPS were no less capable of assessing the strength of the evidence against Benguit when deciding whether to continue to prosecute him. The decision to continue with the prosecution of Benguit for the murder of Jong-Ok Shin was seemingly vindicated because he was finally convicted of her murder. New evidence was provided by a drug addict/prostitute with a remarkable memory who had provided a statement one year after the crime. She said that she remembered seeing Benguit around the time of the murder (she didn't know precisely when or where) in possession of a knife - but not just any knife - it was identical to the murder weapon described by forensics as: " 6 inches long, with a straight edge and a curved tip"! Her statement initially suggested that the knife blade had a "serrated" edge, but her memory was so phenomenal that she then corrected herself in the interview to say that "actually the blade was straight, with a curved tip" She had been called to give evidence for the 2nd trial but had to be discharged from the witness box before she could testify, as she was clearly intoxicated. Her statement was taken down by DC Mark Prince. "This was a wicked crime...Poor Oki-Shin lies dead. Her family must mourn her terribly. From everything we have heard she was a lovely and kind girl. But for the courage of a number of your fellow addicts you would have walked free and you very nearly did. In my view on the evidence presented to this court you are a totally nasty piece of work and a very dangerous young man." Detective Inspector Kevin Connolly of Dorset police who was in charge of the police investigation said: "I would like to welcome today's outcome on behalf of Oki's parents. Today's verdict represents the imprisonment of a very violent and dangerous offender - whose sexual desires drove him to murder Oki. Many witnesses from the drug world gave evidence as they were appalled by Benguit's crimes and I would like to personally thank them. Omar Benguit has now been imprisoned which I hope assists Oki's family to come to terms with their tragic loss." 1) Ms Brown was a prostitute / crack-addict with convictions for dishonesty who made complaints of a serious nature against her police handlers during the murder investigation, which Dorset police found to be false. 2) She originally named another person as the murderer! 3) She said the victim was walking on the wrong side of the street to where she was actually murdered. 4) She said Benguit liked Korean girls and had shouted out while passing Oki "Cor, look at the arse on that!" 5) She named three men who allegedly travelled in her car and who jointly committed various offences involving her later that morning after the murder - Benguit, Gbadamosi and Woolry. No DNA belonging to any of the three men or the victim was discovered in her car and contrary to what Ms Brown said, no resident in the street heard any shouting, or three men running down the street back to her car at 2.50 am. On the contrary, residents said it was a quiet night; some argument could be heard between a man (with a foreign accent) and a woman followed by low moans from the woman. 6) The victim said before she died: "someone came from behind wearing a mask - he ran off and I saw my own blood" . No reference was made to Benguit having had with him a mask and the victim spoke of only one assailant - not three. 7) Beverly Brown later appeared on the Jeremy Kyle show to say that she had actually seen Benguit plunge his knife into Oki-Shin, whereas at trial she had said she couldn't see the actual attack from where she was parked, but could only hear shouts as the three men ran back to her car (which none of the neighbours reported hearing). A motley group of 14 crack addicts and 'smack heads' were assembled to provide highly incriminating evidence of Benguit's guilt. Dorset police should be commended for tracking them down as late as one year after the crime, particularly as all of them shared phenomenal memories about the background to the crime. (1) Mr John Macleod corroborated Ms Brown's evidence by saying in the first trial that "on the morning following the murder, Benguit had blood on his shoes and he confessed he was behind Oki when she was stabbed in the back." (2) Ms Leanne Meyers made a statement in June 2003 saying how she remembered seeing Benguit in possession of a "15cm long knife with a straight edge and a curved tip" around the time of the murder in July 2002. Ms Meyers has since provided the defence with a statement confirming that "words were put into my mouth." (3) Amanda Kelly - reported Omar's 'confession'. (4) John Kelly - reported Omar calling in at his house to wipe his hands on a towel in the early hours of the morning. (5) Charlotte Johnson - reported Omar's drug taking and early morning visit. (6) Victoria Ling - reported that Omar was sweaty, flustered and not normal following the crime. (7) Joan Sheriden - reported on Omar's visit to crack house en route to the alleged offences involving Beverly Brown. (12) Emilene Roberts - corroborating evidence: I was first asked about this on 7th November 2003, but one of the reasons it stuck in my mind is that I dont normally sleep with men. (14) Nicola Hazlett - corroborating evidence: "Members of the jury, you may think she was a completely useless witness who was so much out of it, she did not remember anything"...Mrs Justice Hallett. (15) Mr Jonathan Cutting gave evidence to say he had seen Benguit sharpening "a six inch (15cm) long knife" in his house, although the witness could not remember when this occurred. In reality, the only evidence which linked Omar Benguit to the murder of Jong Ok-Shin was the fact that he lived in the same town as her. 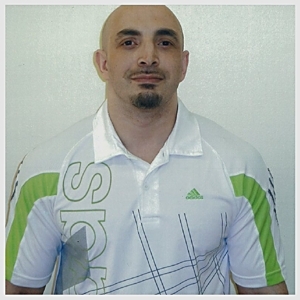 The Omar Benguit trials were conducted by Kate Brown, Chief Crown Prosecutor of Dorset and Alastair Nisbet of the CPS. She says on the CPS website: "Let me assure you, I have a strong team of high calibre prosecutors. What I am doing is to make the team even better." The trials were a travesty of justice which allowed the real perpetrator of the crime Danilo Restivo free to kill only a few streets and months away from where Oki Shin had been slain. Heather Barnett paid with her life for the incompetence of Dorset police, while the Court of Appeal declared Mr Benguit's conviction to be "safe", based wholly on the obvious lies and conflicting testimony of crack addicts. Danilo Restivo settled in Bournemouth in March 2002 having moved there from Italy. His presence was notified to Dorset police by a telex from the Italian police on 29th August 2002, warning that Restivo was a "grave danger to women" and advising that "he should be investigated for the Oki murder". Dorset police replied to their Italian counterparts in September 2002 informing them that they need not worry about Restivo, as they had apprehended Benguit. In November 2002 Heather Barnett was murdered in her own house opposite to where Restivo lived and a few streets away from where Oki-Shin had been slain, but this did not ring any alarm bells with the police or indeed with the CPS even though Restivo was at the scene of the crime offering sympathy to the victim's children. A fresh clump of human hair [picture] was found at the very spot where Oki-Shin was stabbed. 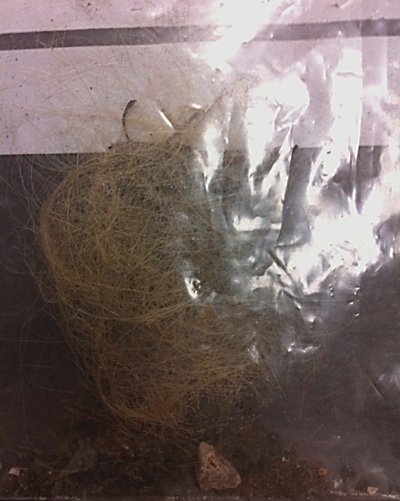 Dorset police have attributed this hair as belonging to a local resident, Ms Donna Welstead, from whom the police took a statement as recently as March 2014. Ms Welstead also had a phenomenal memory:she could recall hiring a mobile hair dresser twelve years earlier in or around 2002, who may have deposited the clump of hair in the street after leaving her home. There is no evidence to suggest however that Ms Welstead ever lived in Malmesbury Park Road and no forensic report has been produced which links the hair to her or to anyone else. In the Heather Barnett trial and in the case of Elisa Clapps, the presence of cut hair at the crime scene was considered to be a unique feature and "hallmark" of Danilo Restivo, but in the Ok-Shin murder case, the significance of the clump of hair lying on the pavement at the very spot where the victim was initially stabbed was regarded as "irrelevant" by the CCRC and the CPS. 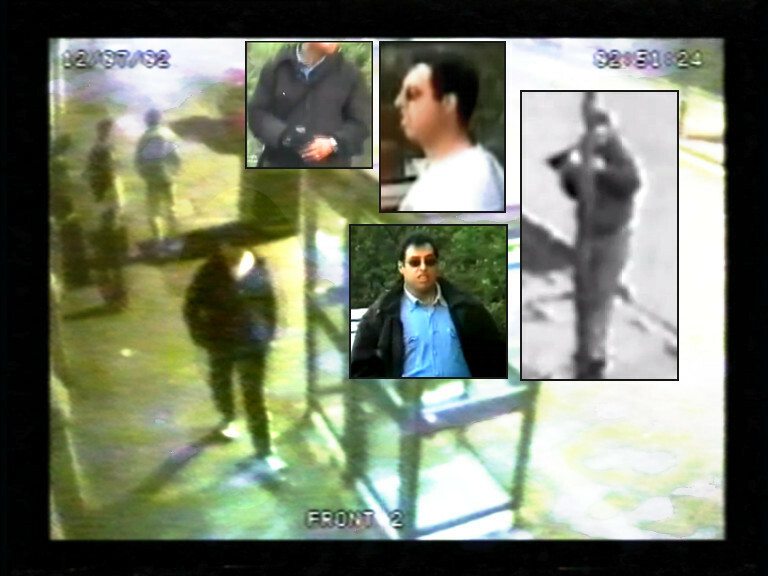 A CCTV image of a man resembling Danilo Restivo seeing walking along Charminster Road Bournemouth towards the murder scene at six minutes past the time of the murder at 2.50 am (the camera time was running slow). Originally it was not thought possible for this to be Restivo until it was discovered that it only took about five minutes to walk around the block from the murder scene to pass the telephone boxes. Notice the dark glasses and a satchell carried over the left shoulder. In the Heather Barnett case Restivo returned to the scene of the crime to "comfort" her children. The forensic pathologist in the Oki Shin case described the knife she was attacked with as single-edged,14-15 cm long, tapering to the point. This exact type of knife was found in Restivo's bag when he was arrested in a park while spying on women on 12/5/04. One of the most extraordinary features present in all three murders is that hair from a complete stranger was left at the scene of the crime by the murderer. A clump of light brown human hair [picture] was found on the pavement at the exact spot where Oki Shin had been stabbed to death and hair was found in the hands of both Heather Barnett and Elisa Claps. Danilo Restivo has admitted having a hair fetish and girls living in his local area had complained to the police about a man surreptitiously cutting their hair with scissors. Mr Michael Bowes QC, prosecuting Restivo for the murder of Heather Barnett, drew comparisons with the murder of Elisa Clapps when he said: "The presence of cut hair after death in both cases... is strikingly similar and is akin to a hallmark." There is no rational explanation for the presence of the fresh clump of hair found at the spot where Oki Shin was originally stabbed other than the fact that it is indeed a hallmark or 'calling-card' of Danilo Restivo. DCI Kevin Connolly, of Dorset Police and the senior detective in the 'Oki' murder investigation, said: Dorset Police can confirm that during the initial investigation into Jong-Ok Shins murder approximately 2,000 items were recovered, including many from the surrounding area  typical with the findings of any major crime investigation. This included an extremely small quantity of animal hair combined with uncut human hair which was located a distance away from the victim on Malmesbury Park Road. They were not found next to the victim or on the victim. They were not attributed to the victim or the incident in any way and, following examination, were excluded from the investigation  this position has not changed." DCI Connolly should not need reminding that a distinct clump of human hair was found at the actual spot on the pavement where Jong-Ok Shin was stabbed (outside 223 Malmesbury Park Road) and whatever other hair was found in the street, this clump was not an 'extremely small quantity mixed with animal hair' and can only be considered in the context of Restivo's hair fetish and the depositing of clumps of hair at the scene of his crimes. It is his 'hallmark' or 'calling-card'. Before Oki Shin died, she managed to tell a doctor that her attacker was "wearing a mask. 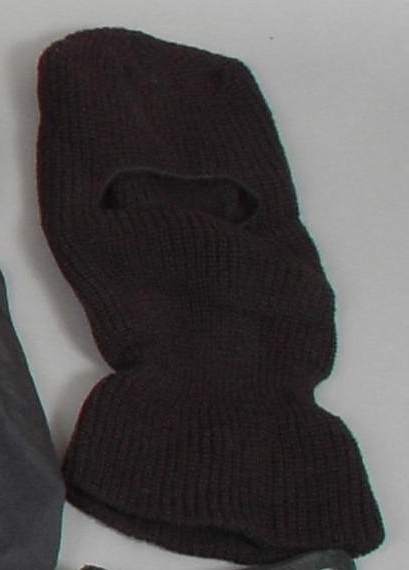 Restivo had a balaclava [picture] with him when he was arrested. Oki Shin was an English language student and had only a basic knowledge of English, so she would have been unlikely to have known the word balaclava. While police watched Danilo Restivo 24 hours a day as a suspect in the murder of Heather Barnett, DCI Connolly, DI Jez Noyce, Det Supt Mark Cooper and DC Mark Prince were sitting in court in January 2005 listening to Judge Lady Hallett harrangue Benguit for being a "nasty piece of work". The Dorset police officers congratulated themselves following the third and final trial and thanked the drug community of Bournemouth for helping to capture a "a very violent and dangerous criminal". The image of missing Korean student Erika Ansermin was found on Restivo's computer. Her body has not yet been found.